Exclusively for Aviation Weather Wise Members. While statistics show only 18% of weather related fatalities were due to wind. In my personal experience the statistics were much higher! Identifying potential turbulence is vital and one of the most difficult hazards to predict or identify. You can’t see it on satellite and there are very few tools that can measure turbulence. Enter the VAD winds and one of my favorite tools. It should become one of your favorites too. The VAD wind profiles are displayed anyplace where there is a Doppler Radar. It measures wind speed and direction with every sweep (7-10 minutes) and at ever thousand foot interval. Along the bottom of the screen, you’ll see the time of the scan.Along the vertical, it shows every thousand feet. Green to blue shows a reliable scan. Yellow to red identify questionable reads (perhaps a flock of birds and not consistent). Consider the barbs like a feather with the non-barbed end moving with the wind. 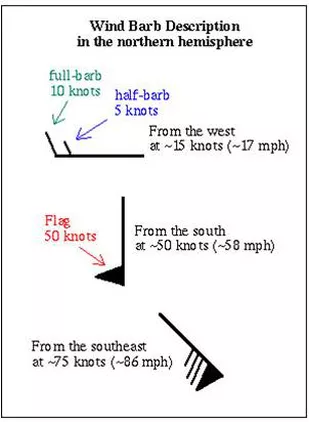 These are great to assess forecast wind versus actual wind. I use it in mountainous areas especially to identify mechanical turbulence.